More than 100 million tonnes of methanol (MeOH) is produced each year, most of which is used as a feed-stock for the production of other chemicals. But over past years methanol has become a subject of research as an emerging new source of energy and fuel. Industrial methanol production processes are generally classified into three groups: (1) conventional two-phase heterogeneous system, (2) liquid phase methanol or three-phase systems known as LPMeOH (3) homogeneous systems. In the first process, the synthesis of methanol from syngas (CO and H2) is performed in a fixed bed reactor, whereas the LPMeOH method employs a slurry reactor. While the three-phase process is more developed compared to other processes but it also suffers from few drawbacks. Mass transfer limitations, the selection of a temperature moderator and heat removal medium and the physical blockage of the slurry reactor membrane by solid catalyst particles are the more prominent of these. Homogeneous systems represent an alternative process that operates at moderate pressure (10-20 bar) and low temperature (100-150°C). Few studies have been undertaken on this subject since the pioneering research conducted in 1979 by J. S. Bradley. In the present work, 6 different catalysts, anhydrous NiCl2, Ni(acac)2, [NiCl2(PPh3)2], Ni(CH3COO)2, NiCO3 and Ni(NH3)4(SO4) were investigated in a titanium Parr reactor. A mixture of carbon monoxide and hydrogen in a stoichiometric ratio for methanol synthesis (H2/CO=2) was employed as a feed gas. The catalyst system comprised potassium methoxide dissolved in a mixture of methanol and tetrahydrofuran. 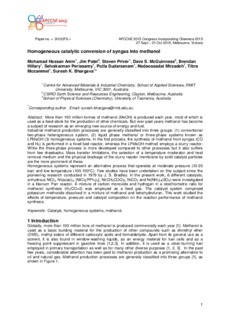 This work studied the effects of temperature, pressure and catalyst composition on the reaction performance of methanol synthesis.